I have been working to get my hair into a reasonable feminine cut for some time. It all started about 6-7 years ago when my stylist said she would like to style my natural mostly white hair into a style that would get me away from my wig. The Florida summer heat was just too much and limited summer getting out. I have written about this before and I have been so pleased with her work and now my new stylist. I love how he cuts my hair. Thank you Michael. My photo is in the center and I really like the current style and how it is working out. That photo was after a long day of work and all I did was turn my head upside-down and comb it out - A little spray and I was ready to go. Even if you wear a wig, studying current modern style is great fun. Find a style you like, copy it to your phone or print it and take it in to your stylist. We are talking about something that is permanent and playing with hair styles is like playing with fashion. A part on the total experience. The Feminine Differential. Enjoy - How far have you been able to go and what is you styling experience? Your picture is very pretty and feminine. I love that style on you. 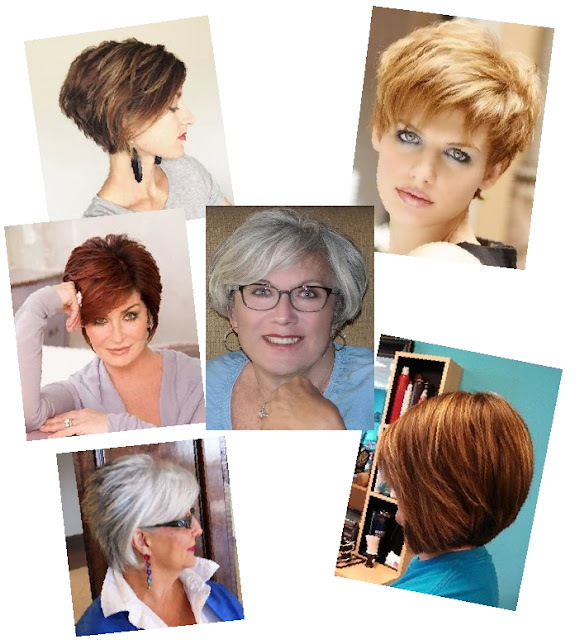 I just discovered this blog site and love it ----I'm going to have my hair styled in a few months hoping to be able to go out without a wig also!!!! I will hope to perhaps post a picture or two and show the result---this salon visit has been WIFE APPROVED as well----she agreed that It's something I do have to experience while I'm able!! !